You must be a member of the Izmir Art & Culture Group to attend this activity. Would you like to join this group? 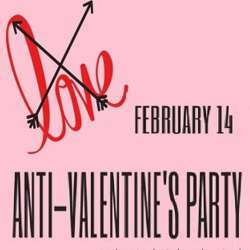 Whether or not you have a Valentine, you're invited to the Anti-Valentine's Day Party! This is where you have to be this Valentine's Day! I'm glad to invite you to spend a splendid Thursday evening starting in the style of Jazz and Entertainment! On the 14th day of February, we're celebrating the single life. If you're single, you're welcome to attend İzmir's most fun Valentine's day party! You can join for dinner, after dinner for drinking or for both of them. All options are available. • Entrance fee 10 try. • All attendees will pay for what they eat or drink directly to venue. • Spaces are limited with 60 people ! Don’t forget to register for this event by clicking the Attend button. • It’ll be a very special event with variety of drinks, food, fun,entertainment . Come and join us for a great, international evening, meet fellow expats, and set the mood for lots of fun! Come to your night with fellow singles for a fun and casual party amongst friend! For this Valentine's day it's time to hook up at our Anti-Valentine's Day Party!